Miss Lucarotti carried out her postgraduate training in the South West region. 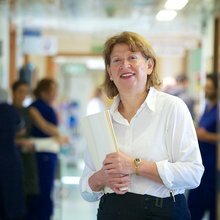 She was a senior registrar in Bristol before being appointed as a consultant in Gloucester 1995 with a special interest in colorectal surgery. This was following attachments in both Bristol and St Marks. She was also a winner of the National British Association of Endocrine Surgeons scholarship and continues her interest in thyroid and parathyroid disease.